The friendship between Lu Xun, China’s most famous writer of the 20th century, and Uchiyama Kanzō, the Japanese bookshop owner who lived in Shanghai for nearly 30 years, is legendary, especially in East Asia. The nature of that friendship, though, has never been fleshed out. 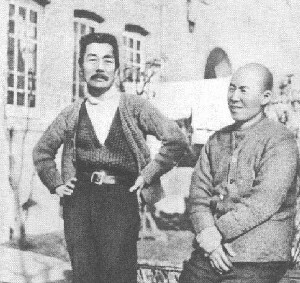 This talk addresses how and why these two men came to Shanghai, for what turned out to be the last years of Lu Xun’s life, and how their friendship was manifest in daily life. Joshua Fogel was born in Brooklyn, raised in Berkeley, studied in Chicago, New York, and Kyoto, and has taught at Harvard, the Univ. of California, Santa Barbara, and York University (Toronto). He is the author editor, or translated of sixty books and founding editor of the online journal Sino-Japanese Studies. His work primarily concerns the cultural dimension of Sino-Japanese interactions in recent centuries. He is also deeply interested in the practice of translation–and an amateur Talmudist.